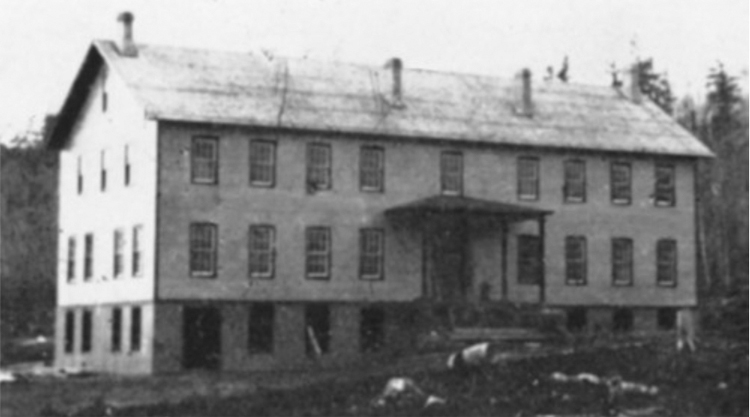 The first building in Duluth constructed specifically as a hotel, the Bay View House offered sanctuary to those lucky enough to get a room during the winter of 1869–’70, when the town was booming and there was no other public house for the waves of people arriving daily. It was full almost year-round, but business declined when the Clark House Hotel opened in the summer of 1870. Bay View House was forced to drop its rates from $4.50 a day to $2.50 a day to compete with the more opulent hotel three blocks east. Located on the western edge of downtown Duluth in the middle of mud streets and plank sidewalks, the Bay View was a three-story wood frame structure; its original entrance faced Fourth Avenue West. The building was later enlarged, and the entrance relocated along Superior Street. The Bay View was demolished in 1888 to make room for the original Palladio Building, lost in 1937.